This question follows me here at the good ol’ SkyVenture NH. When customers walk in to SVNH, they are completely confused as to what the giant ball is over in surf side, which is totally understandable. If I were a first time customer and had never seen the FishPipe before, I wouldn’t know what the heck I was looking at. For those who don’t know, the FishPipe is a simulation of the worlds longest water slide. The instructors will put about four gallons of water inside of the ball and start spinning it on an axis, causing the customer to spin and slide inside, like a water slide. It’s definitely an experience and customers love it! I look forward to hearing more creative names that customers come up with and watching the list grow! Customers, thank you for making us smile. Last Saturday was one for the books! 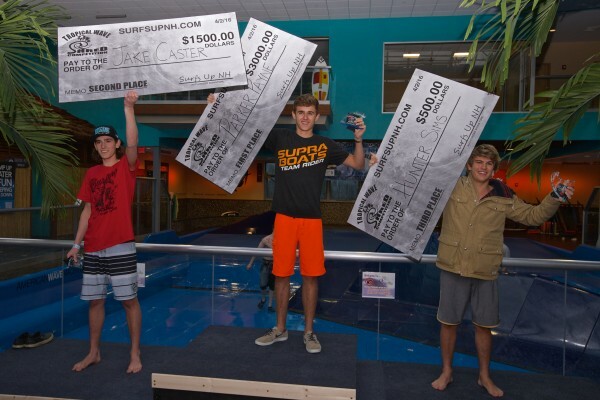 We held the world’s first wakesurfing competition and gathered up several pros to watch them compete over cash prizes! The competition consisted of 4 classes: a Pro, Outlaw, Amateur, and Kids Class. All of the competitors showcased a talent and genuine passion for wakesurfing which made the Tropical Wave Shred all the more entertaining. Hello fellow surfers and tunnel flyers! 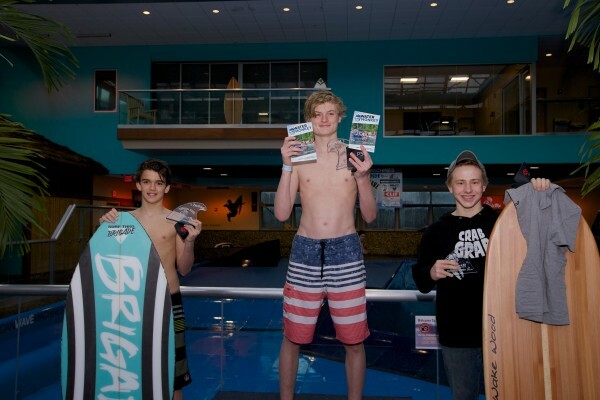 We have been busy prepping for our next event… the first EVER indoor wakesurfing competition! 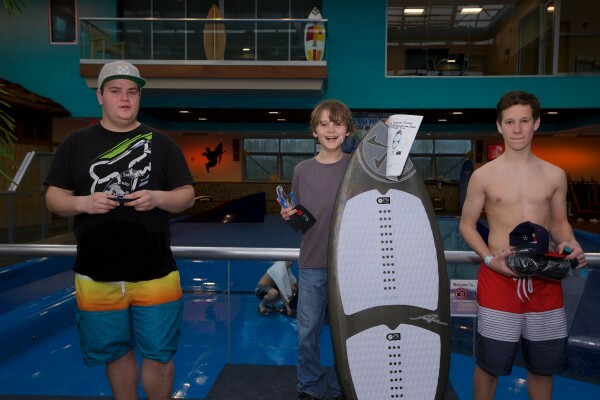 Surf’s Up & SkyVenture NH is hosting our Tropical Wave Shred Competition in just a few short weeks! Registration is now open for the pro, amateur, and outlaw classes. Join us April 2nd for the event – Spectators are welcome! We will have some big names in wakesurfing competing in the pro class – Ashley Kidd and Parker Payne will be joining us, among others! Ashley Kidd was born and raised in Texas and started wakesurfing in 2009. Since then she has been competing in wakesurfing competitions around the world. She most recently won the World Wake Surf Championship for the second year in a row! This will be Ashley’s first visit to Surf’s Up NH, and we are SO excited to have her and see her compete! Parker Payne is another Texas native who has made a big impact on the wakesurfing scene. 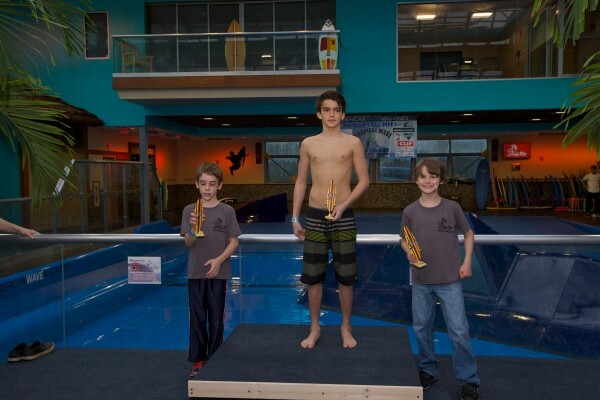 He started competing in 2013 at just 13 years of age, and just a year later turned pro, winning firsts and seconds at several competitions throughout the US. Parker first visited us last year and had a blast tearing up our wave – his unique style was a treat to watch! We look forward to having him here again to compete in the Pro class. If you are interested in registering for the competition, follow this link: http://bit.ly/1M7cPOP Sign up by March 21st to receive your FREE t-shirt! What a way to ring in the warm weather! We look forward to seeing you on April 2nd – whether you are competing or just want to come watch, it is bound to be a good time for all! Get to know one of the voices behind the phones, Tiff, our front desk manager, by reading this Q&A! How long have you worked at SVNH? It will be two years in February! You have one plane ticket to travel anywhere in the world… Where would you go? New Zealand. The landscape is beautiful and I’ve heard a lot about the biodiversity there. I’d love to ride a horse through the fields and pretend I’m in Lord of the Rings. I’ve also heard great things about Iceland. Would you rather speak every language in the world or be able to speak to animals? I’d rather be able to speak any language in the world. As much as I think speaking to animals would be cool, it’s their nonverbal communication that makes them so special. Plus, knowing any language would open so many doors. If you were a box of cereal, what kind would you be and why? Berry Berry Kix, because I love throwbacks and Berry Berry Kix are freaking delicious. I hate this kind of question. I guess I would bring a survival guide, a saw, and a guitar, and just hope I can figure out the rest! Chartreuse. It’s a kind of really light, vibrant yellow-green. It makes me feel peaceful. I think they are kind of creepy, except for that one in the movie Amelie because the gnome photo-series part was adorable. Definitely Diet Pepsi, but I’m not doing caffeine at the moment. Would you rather have legs as long as your fingers or fingers as long as your legs? Both options are horrifying, but I think fingers as long as my legs might be more useful? I have no idea. Probably Jennifer Lawrence – she’s weird, not always photogenic, and trips over everything. I think she would portray me well. 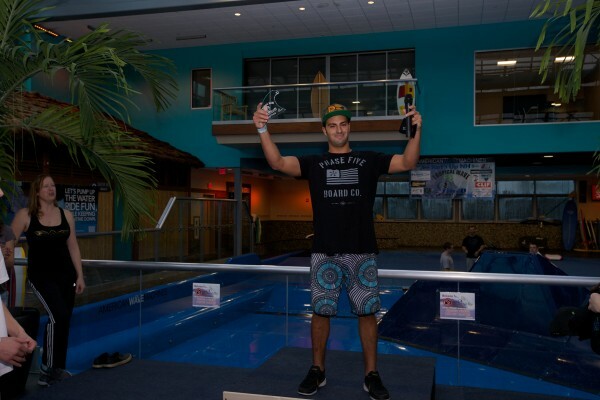 Watch pros like Rob Kelly, Sam Hammer, Keenan Flegel and Cheyne Magnusson shred the wave at the 2nd Annual ESA Indoor Surfing Championships held here at Surf’s Up! 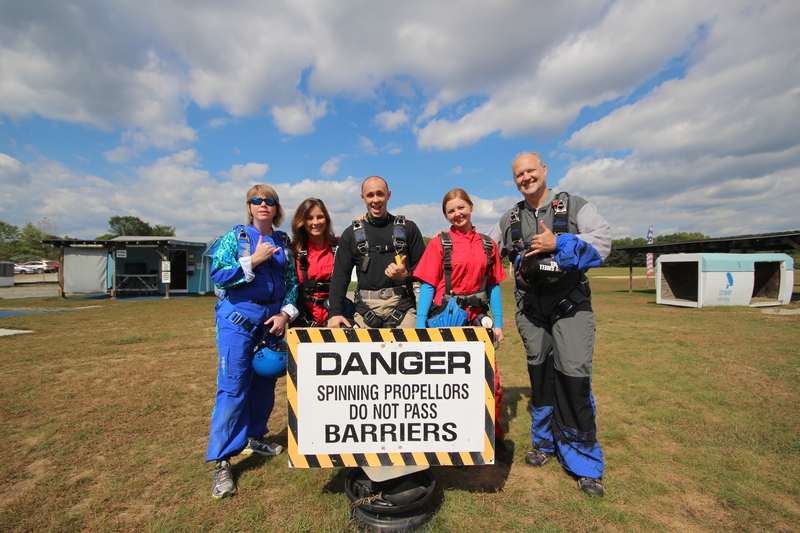 This was a day full of positive vibes, adrenaline and incredible skill– which is exactly what we work towards! To read more about this day click here! If this doesn’t amaze you… then I don’t know what will. Seriously, this is the most insane flying I have ever seen and she’s a junior! Props to her! 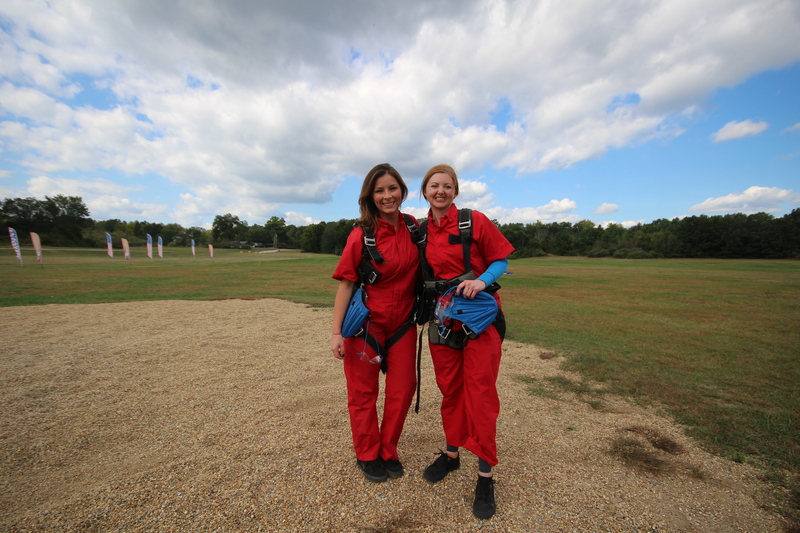 I just got back from my first skydiving experience and now I am sitting at a computer trying to focus on writing this post… and honestly, all I can think about is when I can jump again. I still have adrenaline pumping through my body and I am struggling to get rid of the massive grin on my face because at this point, it is probably creeping out our customers. 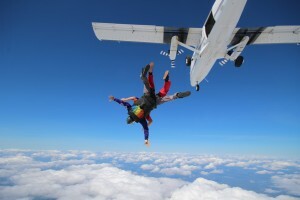 I couldn’t have asked for a better day to go skydiving. The air was crisp, the sky was clear, and the winds were minimal. I woke up so pumped; this was a moment I have been anticipating since I started working at SVNH last year. I arrived at Skydive Pepperell, checked in, met my tandem master, geared up and then shuffled my way on to the plane. The ascent up to 10,000 feet seemed to last forever. All I wanted to do was just jump out already! When we finally reached the right altitude it was time to get out. 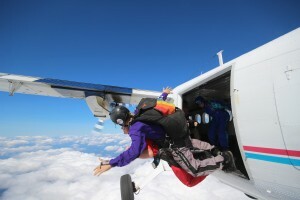 The door opened up and the plane was instantly filled with wind. My tandem master scooted me over to the opening and before I knew it, I was flying through the air! Rushing through the air was a sensation I will never forget, and I think that everyone should experience it at least once in their lifetime. 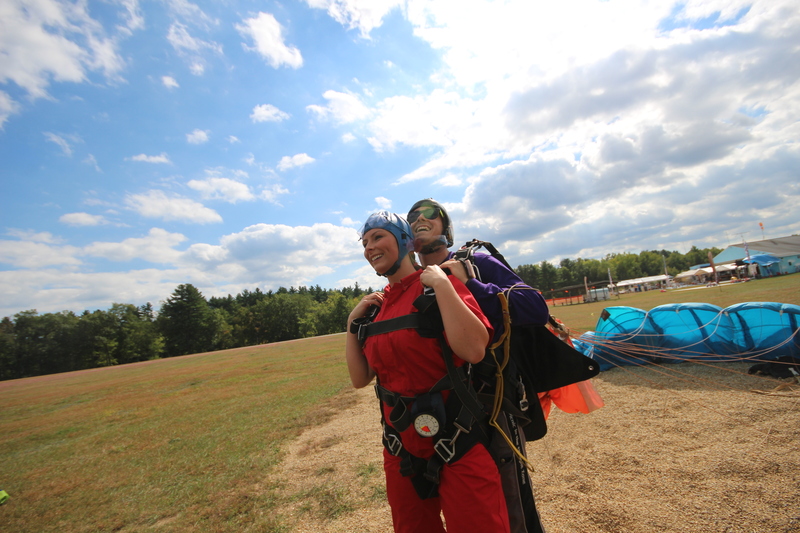 After free fall, the canopy was deployed and we slowly glided through the air. The canopy ride was so peaceful. The only thing that I could hear was my own breathing. My tandem master made sure to point out some of the landmarks in New Hampshire like Mt. Washington, Nashua, Manchester and the Boston skyline on the horizon. I was even able to steer the parachute as we soared over fields and houses! It was unbelievable! When we smoothly landed back at the drop zone I was filled with sadness that it was over. I wanted to hop back on the plane and jump over and over again! When I told family members that I was going skydiving I received remarks like, “Why are you jumping out of a perfectly good airplane?” or “You know it’s dangerous right?” I feel like a total millennial when I say this overused term… but seriously, YOLO! You only live once. I have never heard a single person say that they did not enjoy skydiving, so with that being said, I HIGHLY recommend everyone to go skydiving. 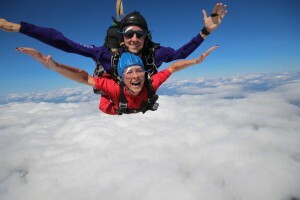 It is always a good idea to step out of your comfort zone and what a better way to do that by jumping out of a plane! 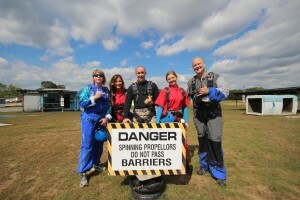 Laurie, me, Alex, Tiff and Rob before our jump! 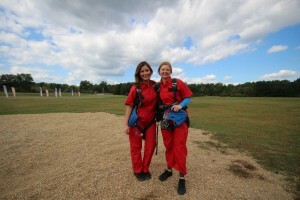 Tiff and I after our jump! Lately we have been pretty busy. 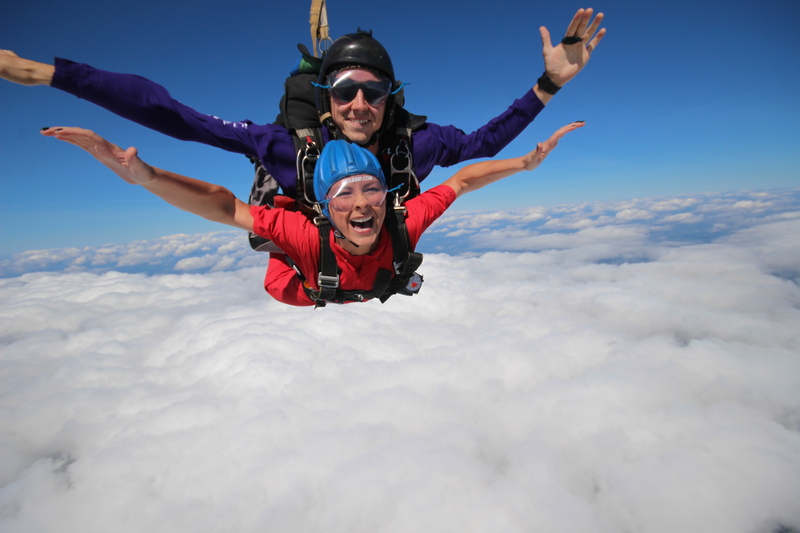 Summer has been crazy here at SVNH because kids were out of school, camps were in session and skydivers are always getting their tunnel time in to practice for jumping. Because it has been so busy here we unfortunately have not been able to take the time to really thank our wonderful customers. Customers, we truly appreciate you! We appreciate the smiles that you bring to us. It brings us genuine joy when we get to watch you have the time of your life. We appreciate your strive to improve at surfing, flying or whatever the activity may be. Seeing the difference of when you started and when you finished is so rewarding; it reminds us that all of our hard work is worth it. We appreciate your efforts to include us in social media. Nowadays, it is so important for businesses to have a strong social media platform and we are incredibly thankful to our customers that have posted about us, tagged us, liked us, followed us, snapchatted, tweeted about us, and reviewed us. We owe it to you for our platform! We appreciate all of the customers that have told their families and friends about us. You have no idea how much that means to us! We could go on and on about the gratitude we have towards our customers but the bottom line is this: We love our customers and are incredibly thankful for all the smiles, warmth and opportunities you have brought into the facility. How amazing is this video? I was mezmerized the whole time I watched it.